Heart of Milwaukee Dahlia. All dahlias seem to change color as they age and are bleached by the sun. Colors also appear different at different times of the day. Cutting this dahlia nearly needed a stepladder. The flowers are held at over eight feet high on smooth dark stems. 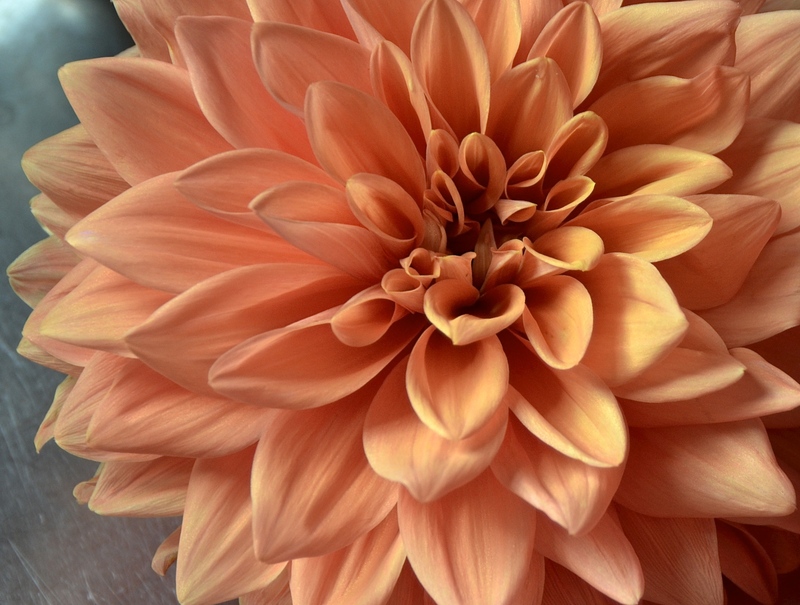 The flower color is almost impossible to describe, as the petals shade from a light creamy orange to a spicy darker center; sort of Cafe au Lait meets Orange Creamsicle. The center of the flower unfurls from its bud with petals that appear tubular at first and then flatten. Like most other dahlias, ‘Heart of Milwaukee’ is fabulous as a cutting flower. Plunge the cut flowers directly into cool water up to their necks and then arrange them at your leisure. There is no bad way to arrange a Dahlia. The tuber for this Dahlia was given to me by a lovely gardening lady from Connecticut, after I admired her winning dahlia exhibit in a flower show. Thanks so much. I am glad to share these photos.